For the past 24 hours, I have been battling on whether or not to mention this on Facebook or not. But this morning, I realized that I really need the support of other mother’s out there who have faced this problem and I want to stomp out the preconceptions of those who THINK like I did about head lice. Back when we lived in New York, every month or so, my kids would come home with a letter from school saying that someone had head lice. I used to cringe thinking about how horrible it must be for a child to have bugs living in their hair. I figured that my OCD tendencies of keeping a clean house and keeping up with good hygiene for my children would keep us exempt from ever having to deal with it. But then, I got the dreaded phone call from the school nurse asking me to come in right away to pick up my daughter, (5 or 6 years old at the time) because she had head lice. I literally PANICKED. The nurse showed me the tiny little bugs that were in her hair and the microscopic eggs that were attached to her hair shaft. There were only a few so the teacher told me that it had just started and that it was a very mild case… but STILL! The crazy thing is, and for those of you who have dealt with head lice – know, that my own head immediately began itching and I was completely paranoid that I had it too. UGH! Removing the lice problem doesn’t just end with treating the hair either. You also have to remove all bedding and stuffed animals and wash in hot water. The mattress and floor have to be vacuumed thoroughly, etc. And you have to constantly check for lice and pick out any eggs for days / weeks afterwards. And let me reiterate that the eggs are MICROSCOPIC. When we moved here to Florida, I thought the lice thing would be over. I have never gotten a note home about anyone ever having it. And after the first head lice situation, I TOTALLY warned my daughter about NEVER using other children’s brushes, hats, or hair items. I told her not to hug kids at school or church, etc. So, when my daughter came into my room this past Monday night saying that her head was itching, the last thing I thought about was head lice. But I took a look at her head, just in case, and OMG… guess what I found???? The difference between this time and last time is that both of our hair is LONG now. UGH!!! My daughter immediately began crying and begged me not to cut her hair. I almost started crying too! MY OCD kicked into full swing and my own head began to itch uncontrollably. I panicked AGAIN! I mean, seriously… I am such a clean freak! How can this happen? Those of you that know me, know that I vacuum almost every day, I never have dirty dishes in the sink, my kids fingernails are always cut short, and I would definitely never tolerate a bug infestation! Come on people! 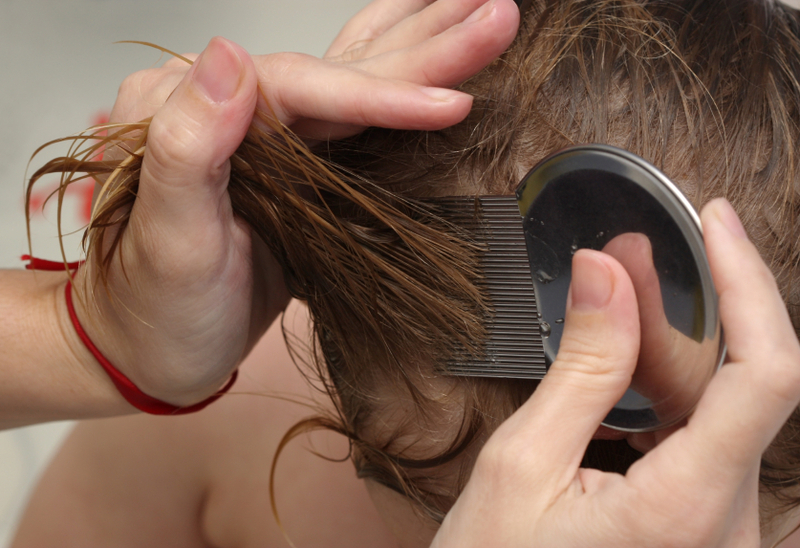 Head lice is known as that DIRTY thing that only people with poor hygiene get. Even I looked on it as something that could never happen to us. But man was I dead wrong! It has happened to us and now happened TWICE! HELP! So, yesterday, I kept my daughter home from school, went to Walmart and spent $30+ on “the stuff” (lice treatment, comb, preventative spray, etc). From 6am till I collapsed in my bed, we worked on eliminating the dreaded problem. It was a bit harder because of her longer hair, but we made it work. The crazy thing is that I did not find ONE LIVE BUG ANYWHERE. There were only eggs in her hair… but those eggs hatch. The treatment doesn’t prevent that. It only helps with removing the eggs. Thank God there were not too many and I will definitely continue to monitor her head on a daily basis. But man, Oh man… what a stinkin’ nightmare! I want to publicly thank my mom Georgette Papandrea for spending the entire day with me, yesterday, helping me with laundry, doing the treatment on my own head (even though we found that I don’t have it), keeping the little boys entertained, and even organizing and putting together socks that I had stowed away in a bin for all the unmatched socks. What a blessing that was! I still have not alerted the school about the lice because I do not want my daughter to be looked down upon or known as the “dirty lice girl”. But now that I have written out my experience and thoughts, I am getting the courage to do so. I mean there could be a child in my daughter’s class who is carrying it and doesn’t know it. I DO NOT want my daughter to get re-infected. I am hoping that me writing this will help other parents to see that lice does not always happen to the stereotypical people. It can happen to ANYONE – even the cleanest person. Lice actually PREFER clean hair so that their eggs will stick better to the hair shaft… Go figure. Anyway, I am really looking forward to hearing your feedback on this one. Have you dealt with head lice in your family? Did you have the same fears that I did? How did you deal with them? Did you keep it a secret? And for those of you who have not dealt with head lice, does my post change your preconception of who can get it? I would LOVE to hear your feedback and always appreciate your words of encouragement and support. Dawn – I think you’re amazing! Wonderful mom (working through all this with your daughter with love and support)…wonderful person (sharing your story to help others)!